Auckland, the gateway to an amazing New Zealand roadtrip. The City of Sails, Auckland’s nickname originated from the two harbours around which it is built and the numerous pleasure boats which its inhabitants love and use. 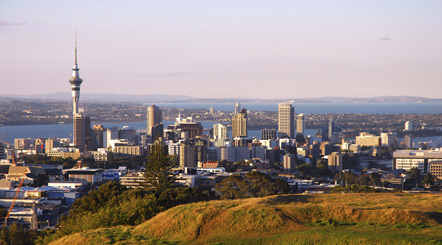 Geographically and culturally, the city is segmented but not disjointed- be it the upscale beach suburbs of the North Shore, the multicultural mountain-backed West Auckland, the chilled South with a strong Pasifika culture, or the bustling and cosmopolitan central city, the Auckland region has a lot to offer. Auckland’s CBD looks over the Waitemata Harbour, whose name means “Shining Waters” in the native Maori language. Devonport and the North Shore are visible on the opposite shore, and the harbour empties into the Hauraki Gulf, a playground for boats and day trippers. The city itself is always buzzing, and has great shopping, restaurants and cafes centred around Queen Street, Auckland’s main drag. To the north, calm swimming beaches backed by pretty suburbs are the perfect place for a family picnic and a coffee at a great cafe. Adventure seekers should head west across the Waitakeres mountain range to the wild west surf beaches, less than an hour from the city centre but a world away. Other highlights of the suburbs are the excellent shopping districts of Ponsonby and Newmarket, and the many volcanic hills dotting the city which all offer great views and green areas. Included amongst these are Mount Eden, One Tree Hill and Mount Albert. Auckland is not only a sprawling city easily explorable by motorhome, but a great starting point to head south on a New Zealand road trip, as most of the international flights to New Zealand arrive at the city’s airport. A pick up in Auckland will take you places!